Positioned in the attractive village of Mithian, less than 1.5 miles from St.Agnes, this bijou, passion flower and wisteria covered property is perfectly placed for a romantic retreat within easy reach of Cornwall's fabulous north coast beaches and holiday resorts amidst the rich tapestry of lush countryside. The studio-style extension to the owners' own residence, a pretty stone cottage, features reversed accommodation offering seclusion and comfort. The living room is light and airy with large Velux windows and exposed timbers and features a sofa bed to accommodate one child. The small corner patio at the front of the cottage has a table and chairs for two - a lovely spot for enjoying a glass of wine or an afternoon cream tea. Just paces from the property, the 16th Century Miners Arms inn serves traditional ales and a tempting range of delicious meals. A short drive will take you to the coastal village of St Agnes with its shops and secluded coves of Trevaunance and Chapel Porth, where you can swim and hire surf gear. Explore the magnificent, rugged and unspoilt coastline from the walking distance coastal footpath that weaves its way over the cliff tops. Nearby Perranporth has miles of golden sands attracting surfers and sunbathers. The vibrant seaside resort of Newquay is less than a 30 minute drive away, with wonderful world famous surfing beaches and a myriad of fabulous eateries and bars, cafes and pubs for all tastes. The cathedral city of Truro lies just eight miles away, whilst The Eden Project, with its giant bio-spheres of flora and fauna from around them globe is just 45 minutes from the property, as is the artist's mecca of St Ives; a picturesque haven of harbour and sheltered beach, with narrow lanes of galleries, gift shops and an abundance of waterside restaurants and inns. One Bedroom: 1 x ground floor double bedroom. Shower room with rain-head shower, basin and WC. First floor open plan living area with kitchen, dining area and sitting area. Perranporth 5 miles; Truro 9.5 miles. St Agnes is a thriving picturesque village on the Cornish coast, with four beaches on the doorstep and surrounded by wonderful countryside. Swim or surf in the clear waters, walk the footpaths and bridleways or hop onto the South West Coast Path. Coasteering, kayaking and horse riding are all available locally, and St Agnes has a regular programme of events and gigs for all the family to enjoy. The local shops offer an interesting selection of produce, from tasty treats to one-off pieces of art as a unique souvenir of your Cornish holiday, and there is a superb range of dining choices with two Great Cornish Food Awards in 2015. St Agnes also has a rich mining heritage which can be explored with a visit to the St Agnes Museum. 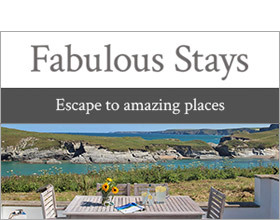 Head out of St Agnes and you will find plenty of Cornwall’s attractions within easy reach, from the beaches at Newquay to the Tate at St Ives or the cathedral at Truro and of course, the world-famous Eden Project. St Agnes is also in the heart of Poldark Country, the landscapes made famous by the novels and TV series’, the most recent of which was broadcast in Spring 2018. So explore this beautiful region or stay close to home in a friendly bustling village; either way you are assured of a memorable Cornish vacation. Note: Short break bookings cannot cross the regular changeover day (Saturday) of this property.